Regardless of your dog's coat type, his hair needs to be brushed regularly. If you have a long- or medium-haired dog, the best way to maintain a clean and manageable coat is to keep it clipped, unless of course, you enjoy styling your dog's hair, like many Poodles or a Lhasa Apso dogs. Short-haired coats are easier to maintain and only needs to be brushed once or twice a week. There are many types of brushes available for your dog's grooming needs. For smooth coats, a regular rubber brush and bristle brush are often used to loosen and remove dirt and dead hair. For short coats, a pinhead brush gets rid of knots and mats, followed with a bristle brush to remove the dirt. To brush a long-coated dog, start with a comb or a pinhead brush to detangle matted hair, then use a wide-toothed comb for the finishing touch. Dogs with silky coats need to be combed or brushed using a pinhead brush, followed by a bristle brush to bring out the coat's natural shine. A nylon bristle works great for your short or medium-haired pet, and a slicker brush easily removes mats and dead hair, which is ideal for everyday brushing. A shedding comb removes loose hair, and a massage brush gives your pet extra pampering. A soft pin slicker is specially designed for dogs with fine, silky, and sensitive skin. 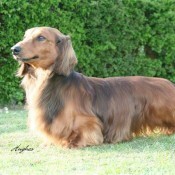 A long coat comb works best for small or toy breeds. An oblong pin brush is used on fine or coarse coats with undercoats, while a regular pin brush comes with wire pins to help detangle mats. A flea comb has fine teeth and a plastic handle to remove fleas and their eggs from your dog's coat. Finally, a de-matting rake removes dead and loose hair from the innermost layer of the dog's coat while leaving the outer coat untouched. Some of the newly advanced dog brushes have bristles made of stainless-steel alloy that claims to neutralise molecules that cause odours on your dog's coat.